Army Gen. John Nicholson, commander of American and NATO troops in Afghanistan, expressed concern Friday over the high rate of casualties suffered by Afghan forces fighting the Taliban, describing it as a "critical" factor in the conflict. Nicholson echoed statements made by Gen. Joseph Dunford, the Joint Chiefs of Staff chairman and the U.S. military’s highest-ranking officer, who described the conflict between Afghan security forces and the Taliban as a "stalemate" during congressional testimony earlier this week. Speaking to reporters at the Pentagon on Friday, Nicholson said he was concerned by high casualties that have persisted since last year, but he did not disclose the exact number of casualties. The commander said in August that more than 900 Afghan security personnel were killed in battles with the Taliban in July. In testimony before the Senate Armed Services Committee on Thursday morning, Dunford indicated that he is uncomfortable with the number of casualties endured by the Afghan forces than American troops are training, advising, and assisting in the fight against the Taliban. "They have taken far more casualties than we are comfortable with and they still have capability caps in their special operations capabilities and their aviation enterprise and intelligence, logistics, and of course probably at the minister of defense, minister of interior level," Dunford told lawmakers on Capitol Hill. "Our focus right now is to further develop those capabilities so we can mitigate casualties that they are suffering, which is a grave concern as well as some tactical setbacks that they have had," he added. Nicholson said Friday that U.S. forces will work during the winter to reequip and retrain units that have suffered high casualties, as they did in the winter months of 2015. The commander said that the most casualties have been suffered by Afghan police forces, which he attributed to lower levels of "training and professionalism" among police compared to the Afghan army. Police officers have been wounded or killed at small police checkpoints targeted by the Taliban, including checkpoints overrun by insurgents in key provinces like Helmand, he said. Nicholson said that Taliban fighters have been able to seize checkpoints in Helmand’s Lashkar Gah, Kunduz Province’s Kunduz City, and Uruzgan Province’s Tarin Kot as a result of "poor leadership" by Afghan security forces. "The technique that they use is to attack specific checkpoints typically along highways and then what we see is an effective use of information ops and cyber operations by the enemy against these checkpoints," Nicholson said. "These checkpoints have been vulnerable to this because of poor leadership at the lowest levels. And when I say poor leadership I mean by the Afghan security forces, where soldiers are not properly supplied, they don’t have enough ammo, they’re not kept well-informed or well-led, and so they become more vulnerable," he said. Ultimately, Afghan forces have prevented Taliban fighters from taking control of these cities. 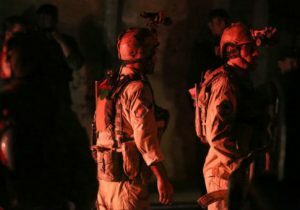 The U.S. military estimates that Afghan forces "control or heavily influence" between 65 and 70 percent of the population in Afghanistan, while the Taliban controls roughly 10 percent, Nicholson said. The remaining quarter of the population is contested. Nicholson agreed with Dunford’s characterization of the conflict as a "stalemate" but said the situation reflects positively on the Afghan government. "This is a positive in the sense of the majority of the population is under the control of the government forces and this is primarily the population centers and so on, and the enemy is primarily in more rural areas that have less impact on the future of the country," Nicholson said. "It’s something we are concerned about, but it’s something we are addressing with the Afghans and hoping to help them move forward next year and increase the amount of control they have," he said. There are currently 9,800 American troops in Afghanistan assisting local forces, a number that will be reduced to 8,400 by early next year. President Obama decided to slow the drawdown of American troops from the country in July, following the publication of a Pentagon report showing that the Taliban had made gains in Afghanistan as U.S. and allied troops had scaled back their commitments. Nicholson, who assumed command of NATO and U.S. forces in Afghanistan earlier this year, said that he would like to see "faster progress" from Afghan forces but expressed confidence in their willingness to fight amid heavy losses.